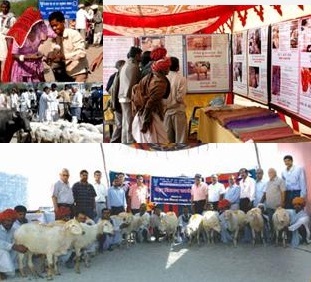 केन्द्रीय भेड़ एवं ऊन अनुसंधान संस्थान, अविकानगर (टोंक) । Central Sheep and Wool Research Institute (CSWRI), Avikanagar: Central Sheep and Wool Research Institute was established in 1962 in Avikanagar (Malpura), in Rajasthan, with a campus covering an area of 1510 hectares and with the principal objective to enhance the productivity of sheep and rabbit through scientific methods by developing and applying new technologies. It has three Regional Research Centres in different climatic zones of the country to develop region specific technologies. North Temperate Regional Station (NTRS) was established in 1963 in temperate region at Garsa, Kullu in Himachal Pradesh. The Southern Regional Research Centre (SRRC) was established in 1965 in sub temperate region at Mannavanur in Tamil Nadu. Arid Region Campus (ARC) was established in 1974 at Bikaner in arid region of Rajasthan. The Institute and its sub-stations have been working for enhancing the productivity of sheep and rabbit by applying scientific methods and developing new technologies.